Camden Heights features one, two and three bedroom apartments with the best location in the Historical Heights District in Houston, Texas. Live in the only Houston Heights apartments with direct access to the Hike and Bike Trail and I-10. Plus, Camden Heights is zoned to the highly acclaimed Harvard Elementary. View our available floor plans here. Perfectly located just minutes from downtown Houston and the Washington Corridor, Camden Heights allows you to experience all the Houston Metro has to offer. When it’s time to meet up with friends, you’ll love the convenience of walking to restaurants and pubs on White Oak or riding your bike to the shopping and nightlife on 19th Street. Camden Heights gives you the location and charm you crave from the Heights neighborhood. Each apartment home is made for entertaining with features like granite countertops, stainless appliances, and wood-style flooring, along with delightful details like wainscoted dining rooms, large walk-in closets and garden tubs. Select homes offer downtown views, double vanity sinks, and separate stand-up showers. 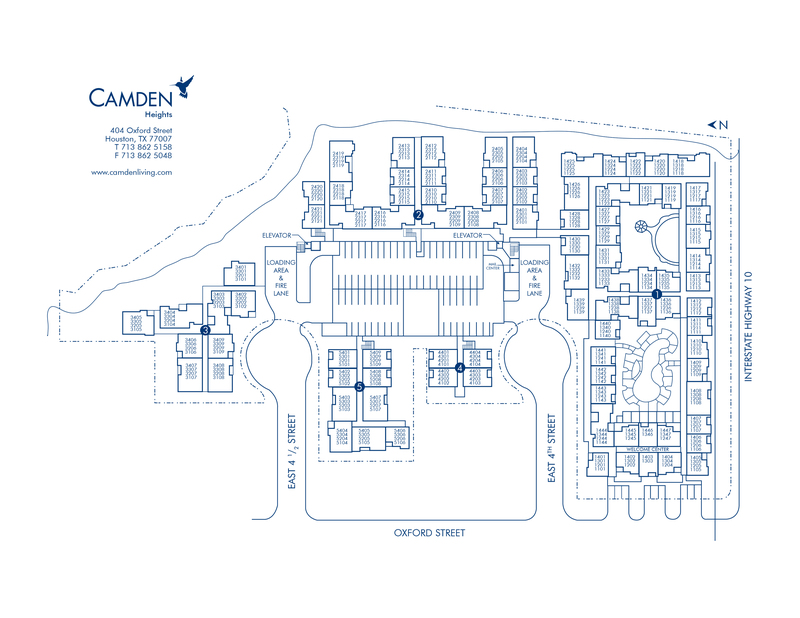 Camden Heights luxury apartments include access to exceptional amenities. From a resort-style pool with waterfall, 24-hour fitness center with cardio and free weights, business center with WiFi and a multi-functional printer to a resident lounge with kitchen, and outdoor grills and dining areas – there’s something for everyone. Our pet-friendly community even has a dog park with pet wash station and agility course for your pets to enjoy. A parking garage with direct access to your apartment home makes life even easier. Live at the best location in the Houston Heights with convenient access to 610, I-45 and US-59, placing you just minutes from Downtown Houston, Memorial Park, Stude Park and the Theater District. Enjoy being close to the Museum District, Medical Center and all four major league stadiums. Come home to Camden Heights. We'll save a spot for you! We offer one parking permit per leaseholder for our direct access parking Garage. The rooftop of the 5 level parking garage is designated for visitor parking. Reserved spaces within the garage are available to rent for $15 - 55 per month. Please call the leasing office for details.